KENNEWICK—Officials at the Kennewick Licensing Service Office (LSO) urge customers to come prepared when applying for the new Enhanced Driver License (EDL) or Identification Card. Staff in this office are sending many people back home for additional documentation when applying for these new cards. The new enhanced licenses and ID cards meet new federal travel requirements under the Western Hemisphere Travel Initiative (WHTI), which requires travelers crossing the U.S. border at a land or sea border crossing station to have a U.S. Passport or other WHTI compliant document. WHTI went into effect June 1, 2009. Individuals and businesses that register and operate commercial vehicles meeting the weight and load criteria below are now required to have a U.S. Department of Transportation number, commonly known as a “DOT number,” issued by the Federal Motor Carrier Safety Administration. The DOT number and Federal Employer Identification Number will now be required when registering a commercial vehicle. Once this information has been provided for a particular vehicle, it will not have to be provided again until the ownership of the vehicle changes. DOT numbers have long been required for commercial haulers that cross state lines. 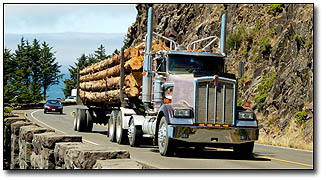 They are used to track the safety records of commercial vehicles and the individuals or businesses that operate them. Operators who are found to have poor safety records can be forced to improve or risk not being able to register their vehicles in our state. Applying for a DOT number is free and can be done by mail or online. 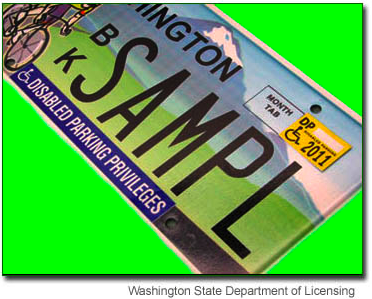 The Washington State Patrol has an excellent flyer (in PDF format) called New Intrastate DOT Number Requirements for Commercial Motor Vehicles. It describes (with words and pictures) this new requirement and how it might affect you as an operator of commercial and farm vehicles within Washington State. It also has instructions on how to apply for a DOT number. The Department of Licensing’s website also has step-by-step instructions for determining if you need to apply for one of these numbers and how to do it. Commercial motor vehicles with a Gross Vehicle Weight Rating (GVWR) of 26,001 pounds or more. Combinations of commercial motor vehicles including a towed unit with a GVWR of more than 10,000 pounds and having a total GVWR of 26,001 pounds or more. Commercial motor vehicles of any size used in the transportation of placarded hazardous materials. Commercial motor vehicles designed to transport 16 or more passengers, including the driver. Private school buses of any weight or size. Farm vehicles that meet the requirements above and are used to transport the farmer’s own orchard, farm, or dairy products, livestock, or plant or animal waste within Washington State are required to have an intrastate DOT number, but they are exempt from safety audits and compliance reviews. As the price of stamps keeps going up, DOL’s hardworking Graphic Communications Unit came up with a clever way to remind customers that they can avoid the price of a stamp by going online to complete their license renewal transaction. DOL received permission from the United States Postal Service to place the text “Save a stamp. 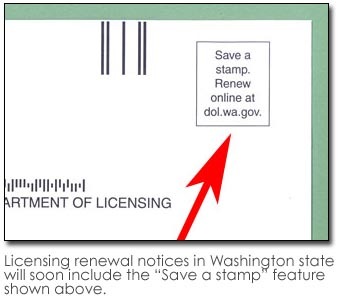 Renew online at dol.wa.gov” in the stamp area on the pre-printed envelopes we insert in renewal notices. Just about all vehicle, boat and business license renewals can be processed quickly and easily online. And many driver license renewals can be done online, too. Please visit our website for more information about renewing your licenses online. We will begin testing these new envelopes soon. You are currently browsing the Licensing Express blog archives for June, 2009.